BakerHostetler is proud to announce that leading trademark practitioner Miriam Beezy has joined as a partner in the firm’s Intellectual Property Group and member of the Trademark and Copyright teams. Beezy’s practice focuses on trademark and copyright matters, including U.S. and global procurement, prosecution, transactions, enforcement, and disputes. Her client experience ranges from high-profile entertainment and hospitality industry clients to biotechnology and pharmaceutical industry clients. She joins BakerHostetler from Foley & Lardner LLP, where she served as chair of the firm’s Trademark, Copyright, and Advertising practice and co-chair of the Entertainment and Media Industry team. Beezy has trademark experience across many industries, including work for entertainment, life sciences, consumer products, technology, and internet commerce companies. In her 10 years at Foley, she developed and managed IP portfolios for global companies. She places an emphasis on commercializing IP, merchandising, and brand extension and brand management counseling, as well as intellectual property rights and design protection and enforcement, including online enforcement. In private practice, she has protected the trademarks of several music groups, including the Rolling Stones and the famous series of tongue logos, the Wiggles, Pearl Jam, Ozomatli, and Korn. She protected and handled IP work for clients such as Muhammad Ali, Jane Seymour, Roseanne Barr, Wayne Gretzky, and Robert DeNiro’s company Tribeca and the Tribeca Film Festival. 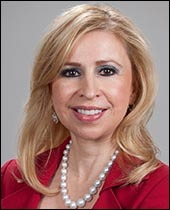 While serving as chief trademark counsel of The Walt Disney Company, she managed the company’s worldwide trademark portfolio, handling intellectual property issues related to consumer products, motion pictures, television, musicals, video, theme parks, sports teams, restaurants, cruise lines, apparel, toys, collectibles, and retail stores. Beezy joins a Trademark team with more than 30 attorneys based in offices across the country, including New York, DC, Cleveland, Seattle, Costa Mesa. and Los Angeles. The trademark team has extensive experience in providing creative strategies to prosecution issues, cost-effective approaches to brand protection, and effective, business-savvy solutions to enforcement issues and infringement allegations to companies large and small, in hundreds of different industries. Beezy has handled matters for top international media and production, manufacturing and technology, gaming, and promotions companies. Her biotechnology experience includes brand strategy development for worldwide chemical, pharmaceutical, and cosmetics companies. In 2007, she won the prestigious California Lawyer of the Year Award for her work on an expedited global rollout of a new anti-HIV drug. She is the only practitioner to win the award for work in the trademark law field. Beezy also has extensive experience representing top companies in the fabric, internet and e-commerce, computer networks, software and hardware, merchandise, consumer products, food, apparel, jewelry, and retail industries. In recent months, BakerHostetler has made major additions to the firm’s West Coast offices and continues to commit to a robust Southern California IP practice. Beezy joins the firm’s LA office following the addition of fellow IP Partner Alan Friel <http://bakerlaw.com/press/media-convergence-and-privacy-attorney-alan-friel-joins-bakerhostetler-in-la> , who has a deep background in media, privacy, and consumer protection law, and Randy Gainer <http://bakerlaw.com/RandalLGainer> , a Certified Information Systems Security Professional (CISSP) who joined the Seattle office as a member of the Privacy and Data Protection team in March. This growth further fuels the momentum from BakerHostetler’s combination <http://www.bakerlaw.com/press/bakerhostetler-and-woodcock-washburn-completes-strategic-combination> with national Intellectual Property firm Woodcock Washburn, a merger that added nearly 70 IP attorneys and three new offices to BakerHostetler’s national profile. Beezy is a sought-after presenter and author on trademark, copyright, branding, product merchandising, enforcement, counterfeit IP, and managing portfolios. She was included in the American Lawyer magazine 2012 “Women Leaders in the Law” and has been listed as a leading practitioner in the World Trademark Review 1000 and Legal 500. She is adjunct faculty at Southwestern Law School, where she is a professor of trademark law. Beezy received her J.D. from Southwestern University School of Law in Los Angeles in 1986, and she received a B.A. in Psychobiology from the University of California at Los Angeles.